2011 | Gorelick, Michael. �City Without Walls director resigns.� WestWardPatch, September 30. McGlone, Peggy. �Awesome works of art.� The Star Ledger, June 17, p. 21. Paikert, Charles. �City Without Walls: beauty and barbed wire.� WestWardPatch, May 21. Bischoff, Dan. �Brick City�s art identity.� The Star Ledger, February 20, Section Four Cover. Soarantino, Drew. �A league of their own.� New Jersey Monthly, February, p. 85. 2010 | Dooe, Mary E. �City�s renewal is work of art.� The Star Ledger, December 11, p. 1. �Hudson County artists in Newark event.� Jersey Journal, September 24. Wallner, Susan. �State of the arts: LOL @ cWOW.� NJN Public Television, April 29. Schwartz, Michael B. �Stim-U-Murals.� Community Arts and Murals, January 21. 2009 | Genocchio, Benjamin. �Works from new talent seeking a boldface name.� The New York Times, March 5. 2008 | Jacobs, Andrew. �Planning for Newark�s next big step.� The New York Times, January 18. Jackson, Chanta L. �High school artists team with mentors" The Star Ledger, June 12. 2007 | Genocchio, Benjamin. �A show of small works, and a group sampler.� The New York Times, December 9. Theodore, Jeff. �Visionary makes art accessible to the masses.� The Jersey Journal, November 23. Bischoff, Dan. �Artfully geared for mass market.� The Star Ledger, September 28, p. 43. Weiss, Jennifer. �This could be music to an artist�s ears.� Sunday Star Ledger, September 23, p. 2. Genocchio, Benjamin. �This landscape is your landscape.� The New York Times, February 18. Hague, Jim. �The best of both worlds.� Weehawken Reporter, January 14. 2006 | Genocchio, Benjamin. �A showcase of talent, homegrown and established.� The New York Times, November 5. Genocchio, Benjamin. �Renovation & extra security for alternative gallery.� The New York Times, June 25. Bischoff, Dan. �Dynamic duos.� The Star Ledger, July 14. Bischoff, Dan. �Make room for drawings.� The Star Ledger, September 22. Bischoff, Dan. �Gallery still finding alternatives in Newark.� Star Ledger, May 21, sec 4 p. 7. 2005 | Cotter, Holland. �Emerge 6.� The New York Times, December 9. Genocchio, Benjamin. 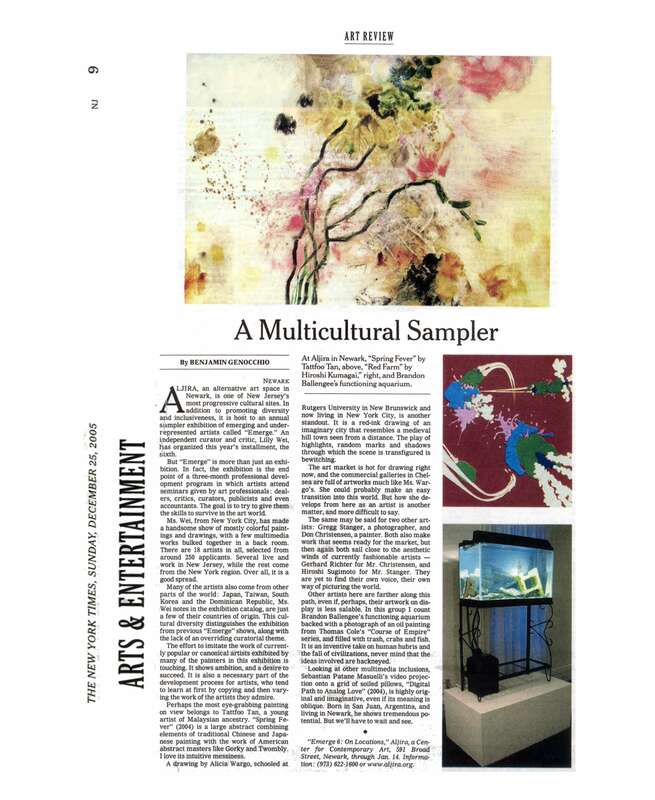 �A multicultural sampler.� The New York Times, December 24. 2004 | Toni, Royce. "Ben Goldman.� The Artist Lounge Series. (TV Pilot). Los Angeles: Rtistic Pollution. Theodore, Jeff. "Nohu arts scene on the rise.� Jersey Journal, October 30, p. 1. Hague, Jim. "If there�s SoHo, why can�t there be NoHu in North Hudson?.� Weehawken Reporter, October 10. Hoffman, Dave. "Urban Complex: Artists from five towns featured at Courthouse exhibit," Hudson Current, October 6. Rosero, Jessica. ""The SoHo of New Jersey: Eight North Hudson (NoHu) artists will be exhibiting at the Union City Park PAC throughout May.� Union City Reporter, May 2. Aragon, Mabel. "New Jersey�s Secret Soho,� Neighborhood Journal, Hudson News Edition, Cablevision Channel 18, March 9-10. Hague, Jim. "An Area Called �NoHu�: Jersey City Museum slide show focuses on the influx of artists in North Hudson.� The Weehawken Reporter, March 14. 2003 | Carlson, Catherine E. "Urbane meets urban hip at the Regent Hotel." Voices of Lower Manhattan, April 4. Philbin, Gail. "Trio at UICA: three artists display diverse works." Grand Rapids Press, May 18, p. F4. "Freedom of�." Smartly Appointed. Grand Rapids, MI: A.K. RiKK�s. "Gallery", Evansville Courier & Press, November 20. "Exhibit features national artists.� Dubois County Herald, November 6. 2002 | Apple, R.W., Senator Hillary Rodham Clinton, Mayor Anthony Williams, et al. True Colors: Meditations on the American Spirit. Washington, DC: Meridian International Center. Richard, Paul. "True colors: meditations on the American spirit." The Washington Post, March 3. Cotter, Holland. "Amid the Ashes, Creativity." The New York Times, February 1, pp E33, E35. Shaw-Eagle, Joanna. "America�s �true� spirit on display." The Washington Times, February 23. Lombardi, Dominick. "Since Sept. 11, benign works become haunting." The New York Times, June 9. Hague, Jim. "Strokes of genius." The Weehawken Reporter, January 20, pp. 1 and 6. 2001 | Herman, Lloyd E. "The shape of shadows." In Object Lessons: Beauty and Meaning in Art. Madison, Wisconsin: Guild Publishing, pp. 83-112. Bischoff, Dan. "Deuces are wild." The Star Ledger, January 29, pp. 26-26. 2000 | Kazmierczak, Elka, ed. Eyes Wide Open: Artists� Perception of Conflict. Buffalo, NY: SUNY Buffalo. Hague, Jim. "From politics to art with a single stroke." The Weehawken Reporter, June 11, pp. 1 and 6. Bischoff, Dan. "At 25, gallery still exhibiting its youth." The Sunday Star Ledger, May 7, s4, p2. 1999 | Bischoff, Dan. "Mixed-up media." The Star Ledger, September 22, Art notes.